OK, it’s been a while since I last posted. Let’s just agree it was a year not to be forgotten. I’m happily recuperating from back surgery and finally feeling more like myself. “the Happy Crafter” so as we are planning baby Hailey’s first birthday celebration in Disneyland, I’m inspired to make some goodies! 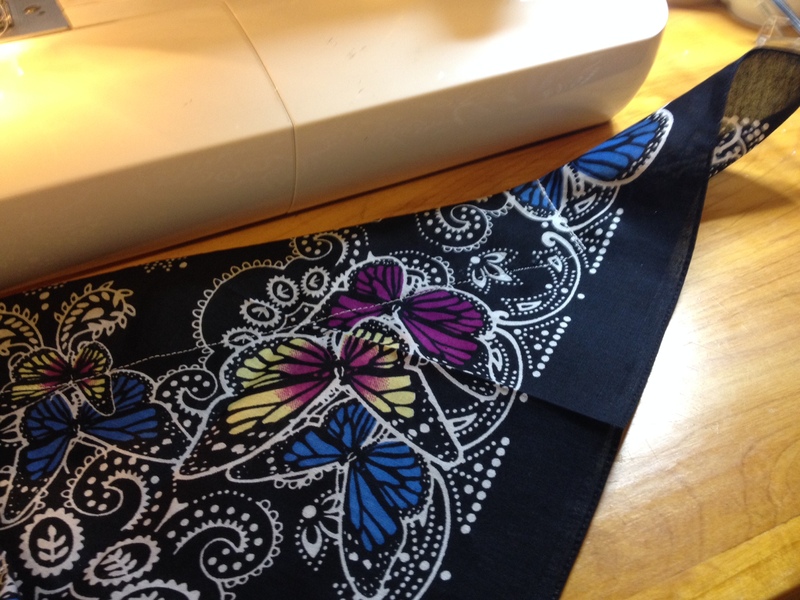 If this one looks familiar, it is a variation of the 10 min table runner. Of course, you want to wear a table runner on your head, right? 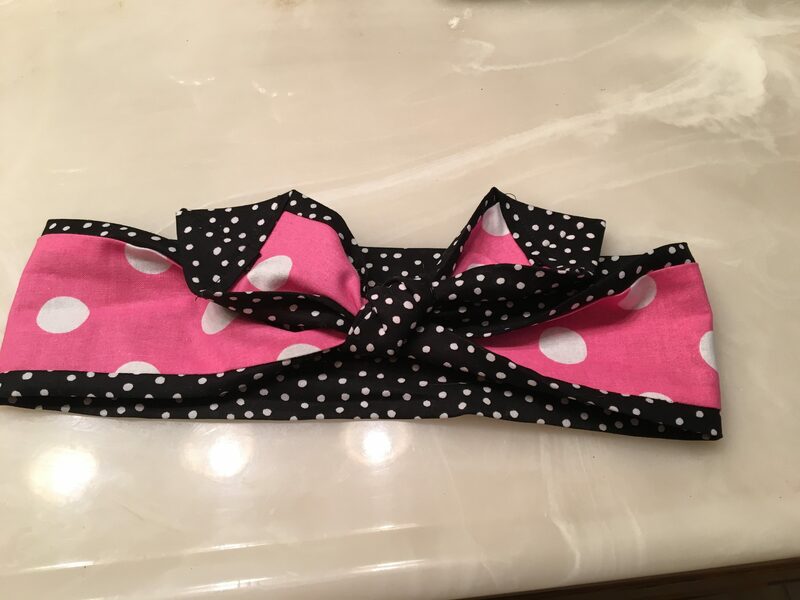 But I was looking at the retro head wraps on Pinterest thinking….. Disney inspired but not soooo mousey. 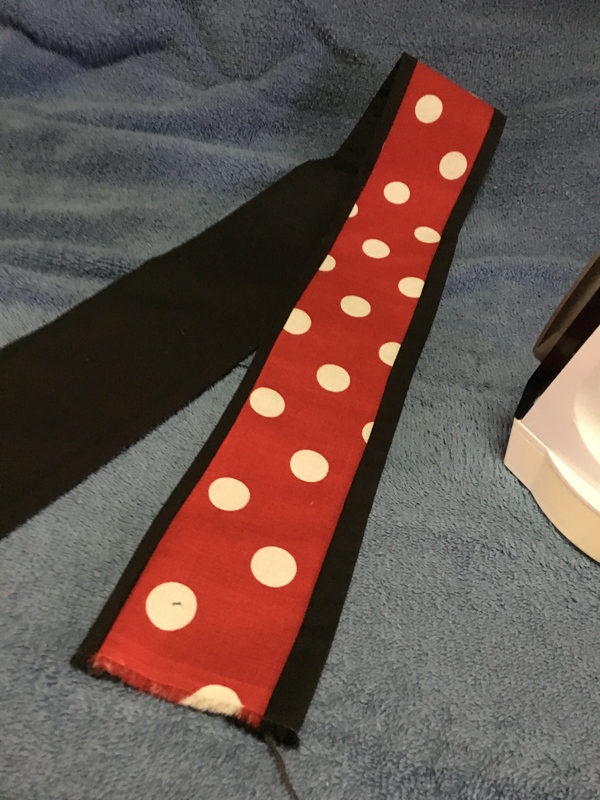 As you can see, I choose a large polka dot in red and pink, and small dot black and solid black. This is what happens when I can’t make up my mind, I choose them all! There’s 10 of us going, so I made several options for us to share. I like to cut on a mat with a guide. Cutting straight seems to not be my strength. 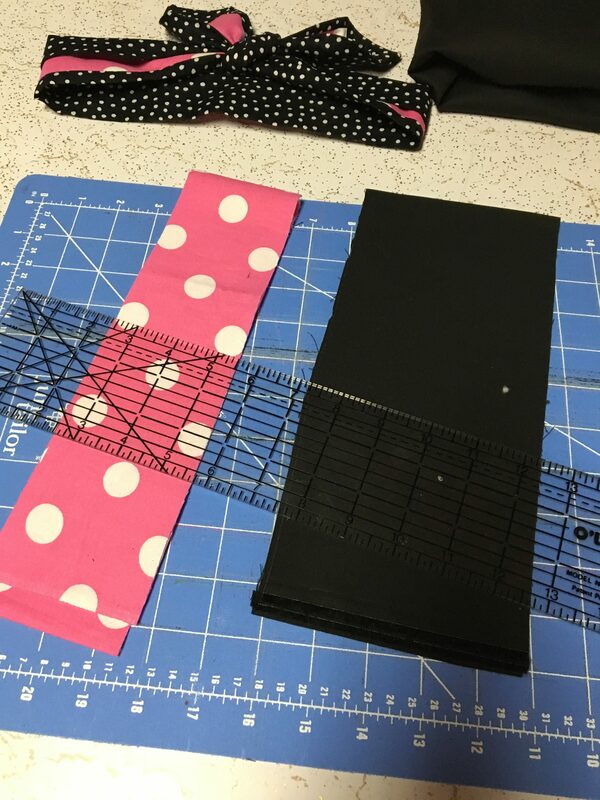 Cut the backing and edge fabric 5″ and the center piece 3″. 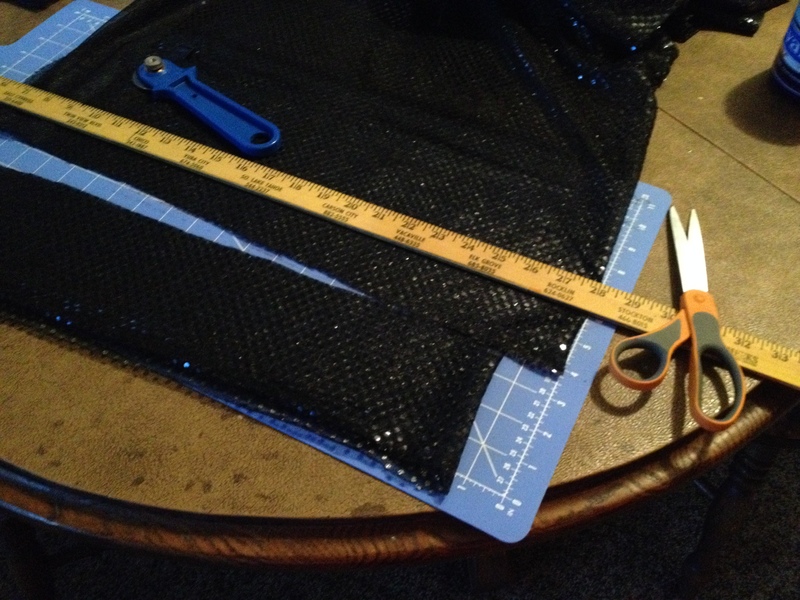 I just left the length from the fabric store (44′ i think) and trimmed it after I put it together. 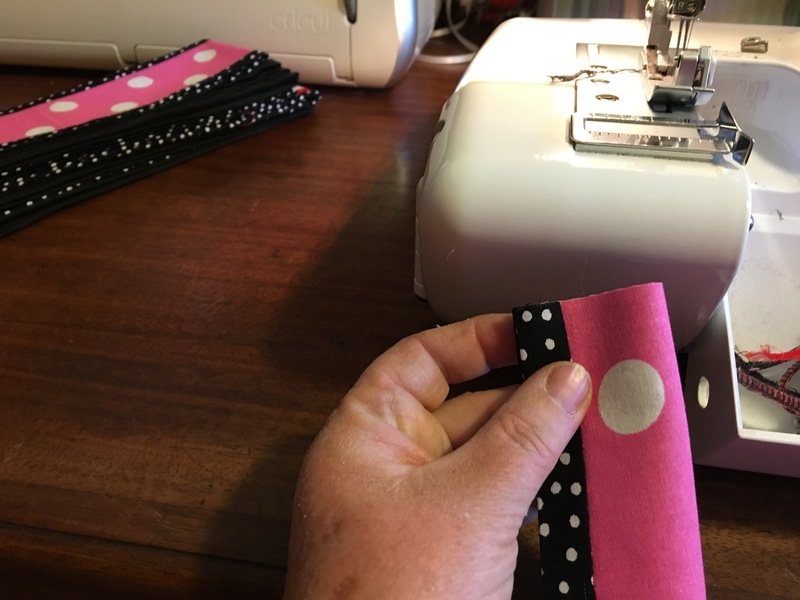 This project is so easy, I would totally recommend it as a mom/daughter learning to sew tutorial. 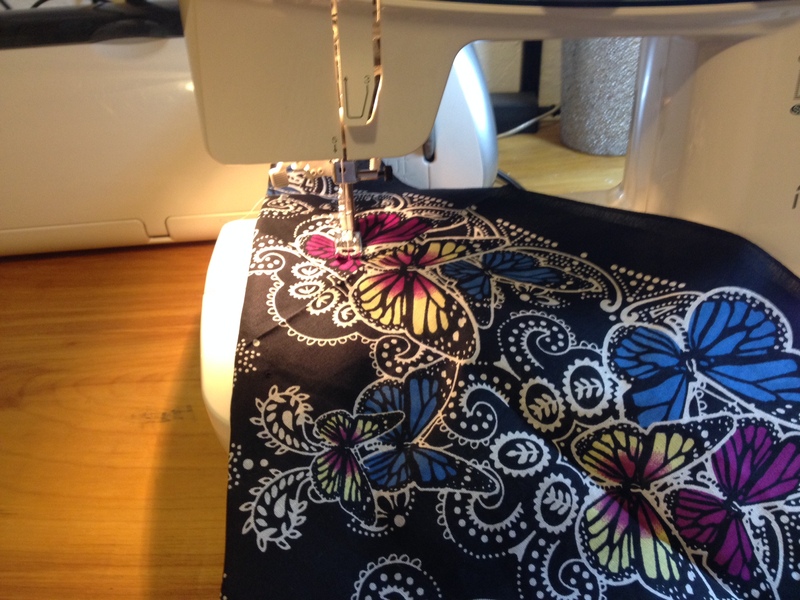 Let them pick the fabrics and do the cutting and sewing. 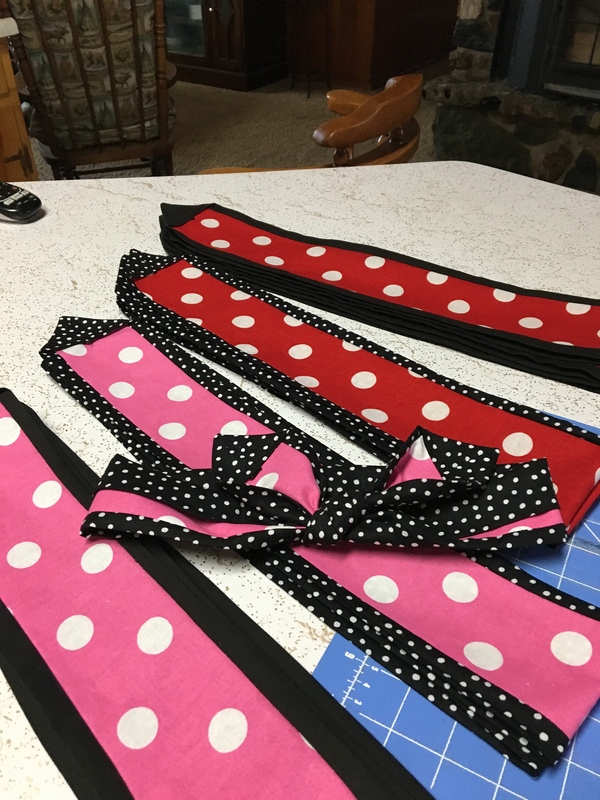 I measured around my head, it was about 24″ so I added 12″ for the ties and came up with 36″ total. 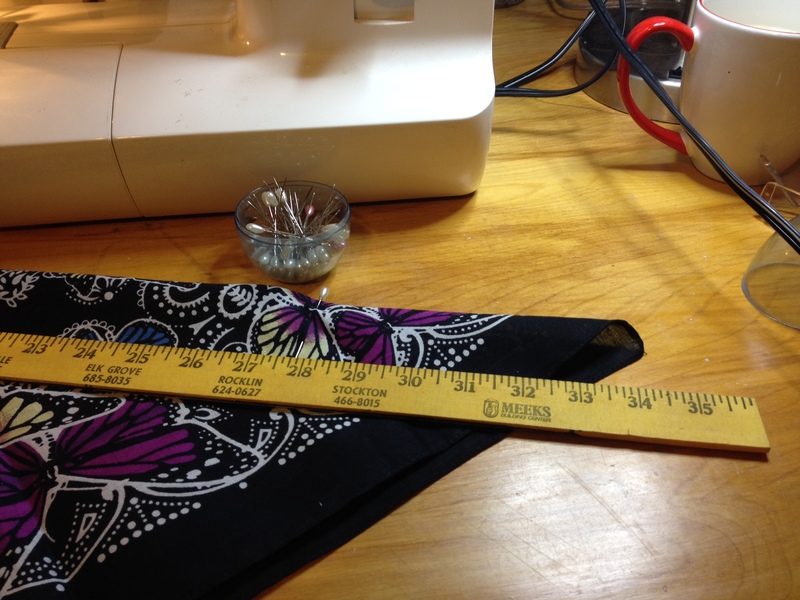 You can alter that measurement shorter if you are sewing for a child, or add if you have that one friend with the really big melon. 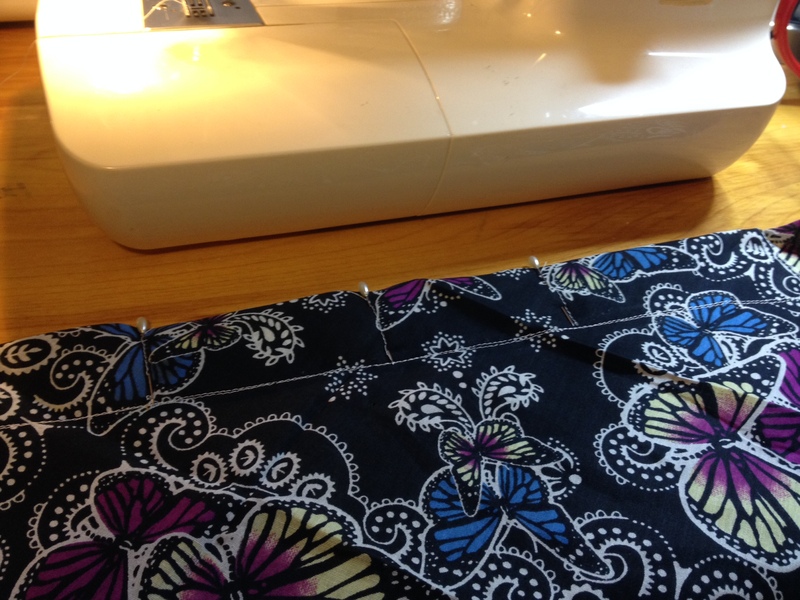 Sew the right sides together, I used my serger, one of the best investment I’ve made in crafting. But you could totally do this on a basic machine. 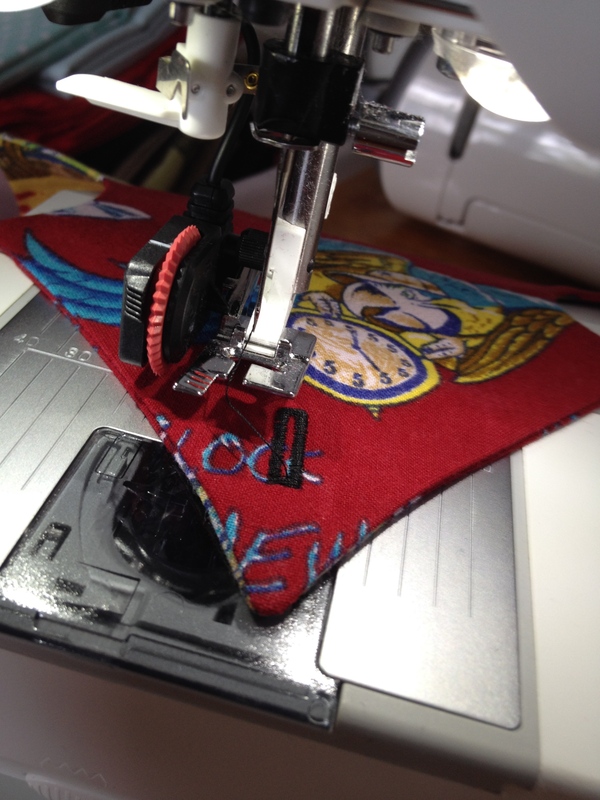 Make sure to get good seams and turn right side out. 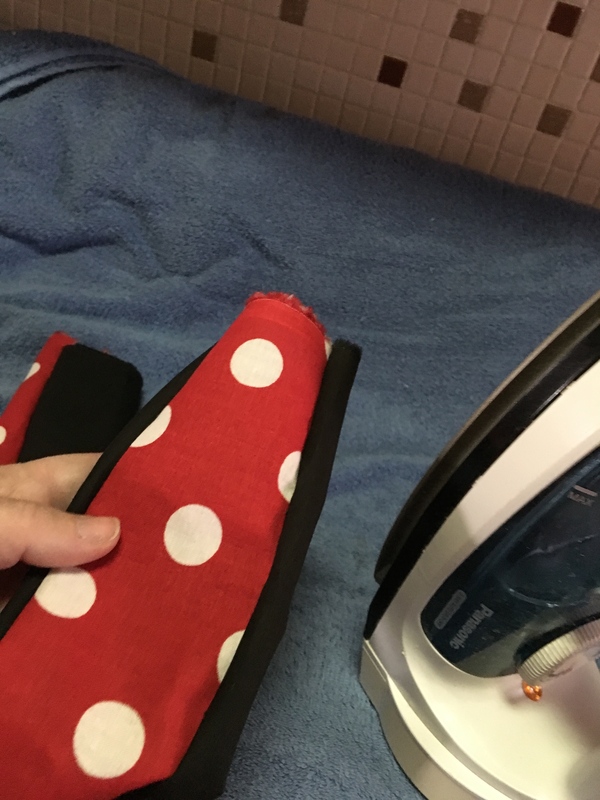 Press the tube with the seams outward toward the edge. Now the tricky part, creating the ends. It’s really quite simple, fold the tube backwards. 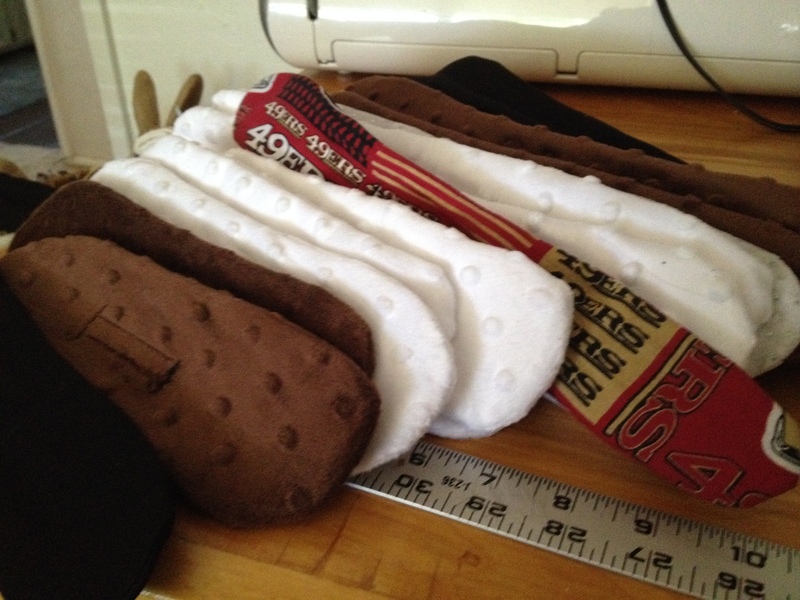 Yep, with the back edges even fold lengthwise. Then sew shut the short end. This make the point when you fold it down. 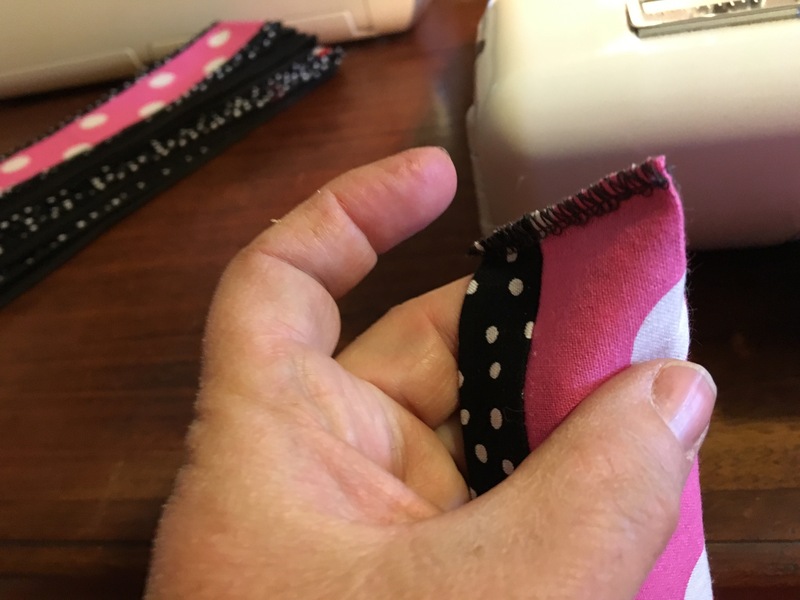 Be sure to use your scissors or other pointy thing to get the point out, if sewing on a conventional machine trim the fabric to reduce bulk in the point. See? it’s really quite simple! Now all you need to do it tie it around your noggin!! 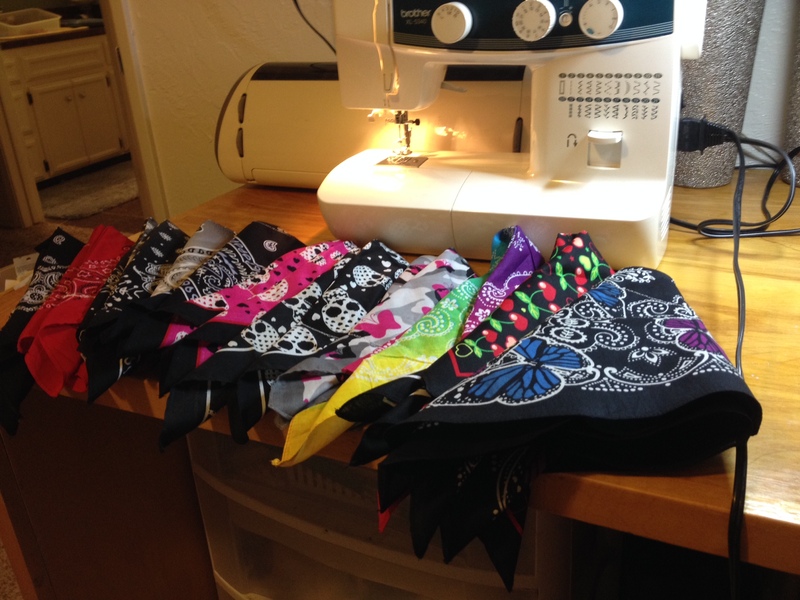 There they are…all dozen Minnie inspired headbands, can’t wait for vacation! Ok, so I’m going to blame Frank for this. Was it his fault? No, I never said that, I just said I was going to blame him. So, you ask how was this his fault? I bought him a shirt for the rehearsal dinner. (In case you didn’t know, youngest son is getting hitched in June) and I asked him to try it on. Several times I asked him to try it on…. I got an XL because I loved the shirt, and they didn’t have a large. 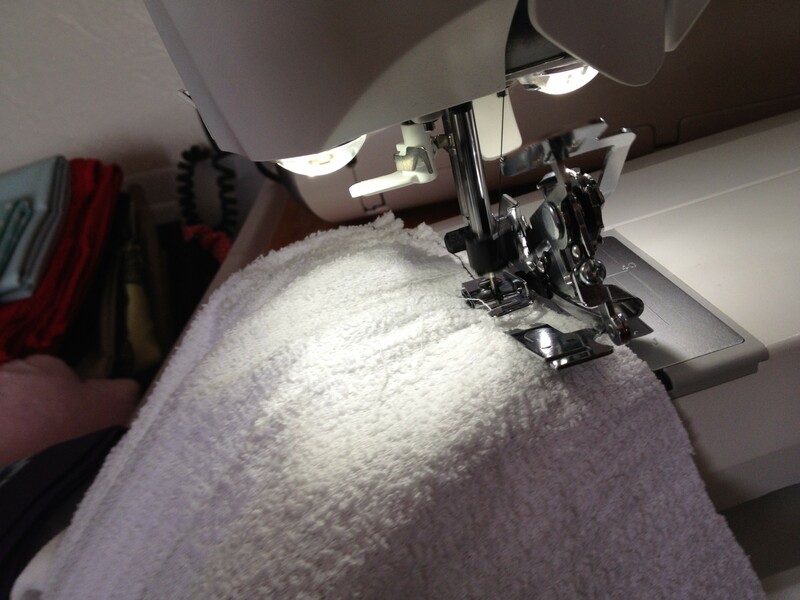 I’m pretty handy with the sewing machine, and I figured I could just take it in some. Problem was, he wouldn’t try it on while I was available to mark it. Long Story short, he tried it on alone, told me it was really big, and I took it upon myself to take it in, sans measurements. Needless to say I took it in too much! Ugh! 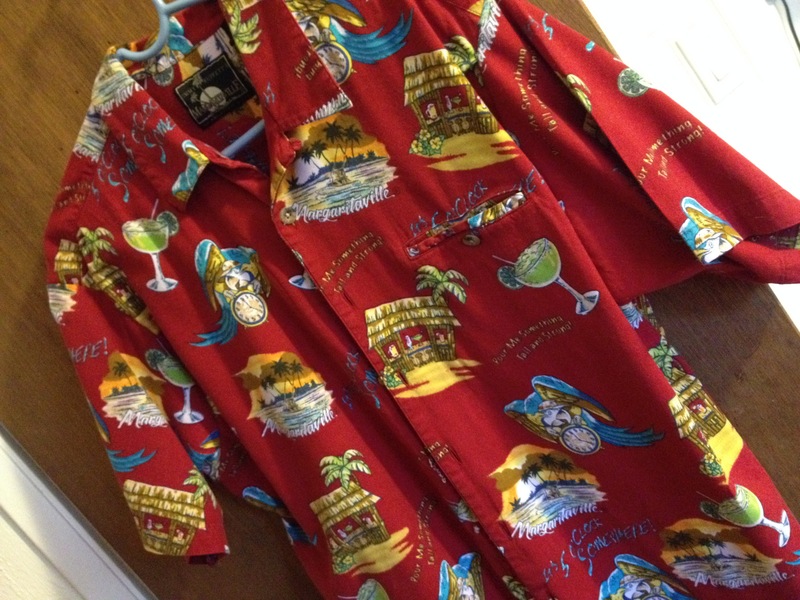 A perfectly good, Jimmy Buffett Margaritaville Shirt, too small!! After blaming him relentlessly, and a good nights sleep. INSPIRATION!! Bar towels for the Margarita bar at the rehearsal dinner. GENUIS…. 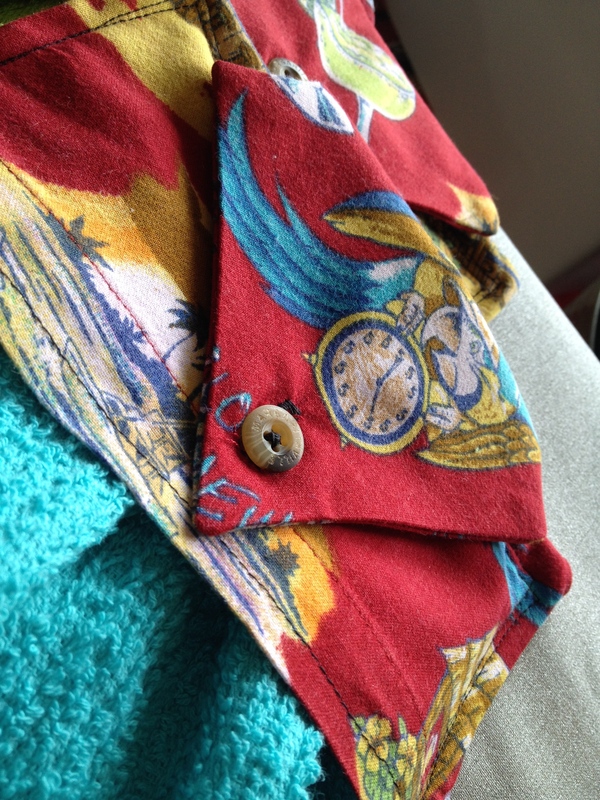 So early this morning, scissors in hand, I chopped up what was left of the shirt, removed the super cool buttons (they say Margaritaville on them) and began redeeming my sewing confidence. 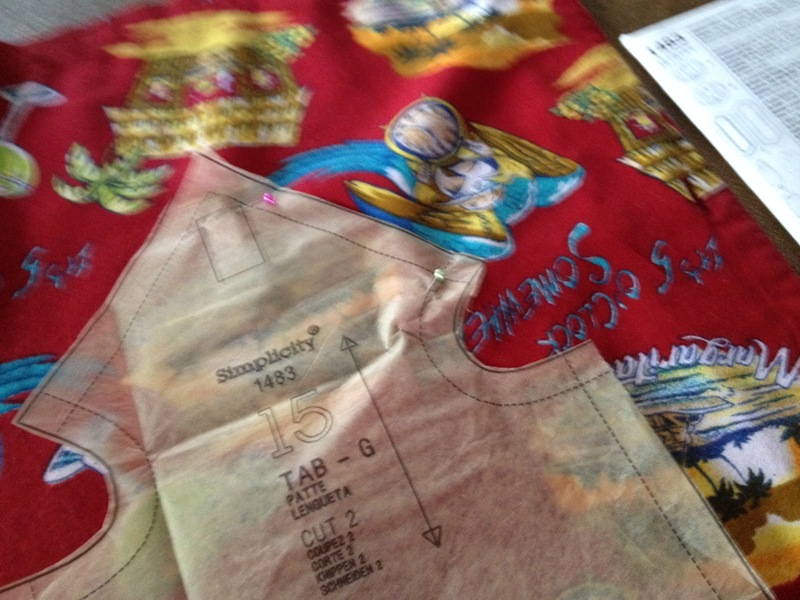 I did use a pattern, Simplicity #1483, since I really didn’t want to screw this up. This pattern retails for $17.95, but if you watch for your local fabric/craft store sales, they will go on sale for 5/$5.00. I picked this one up months ago during one of those sales, and finally used it on this project. I may have spent a little too much time attempting to get the coolest parts of the fabric strategically placed. Could of probably gotten another set of tops, but I tend to fuss over details. 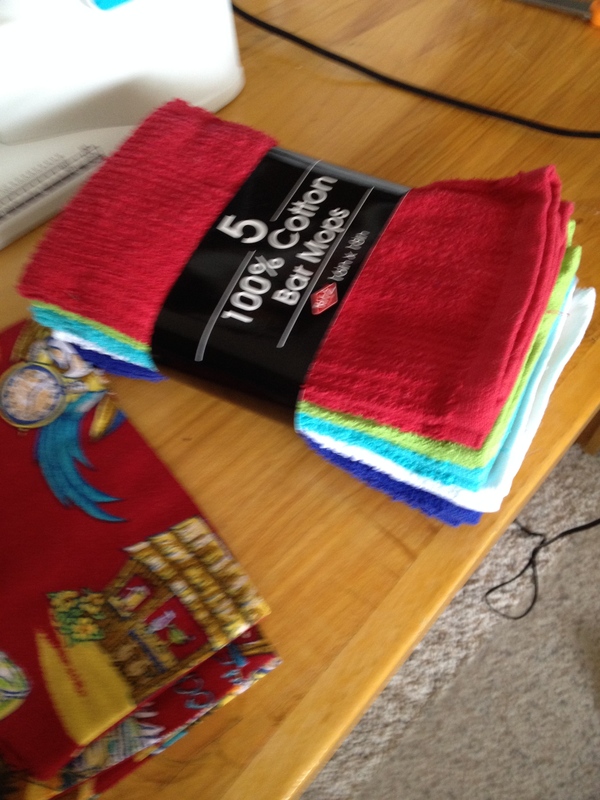 Worked out OK, I got five tops, and the package of bar towels came with five! 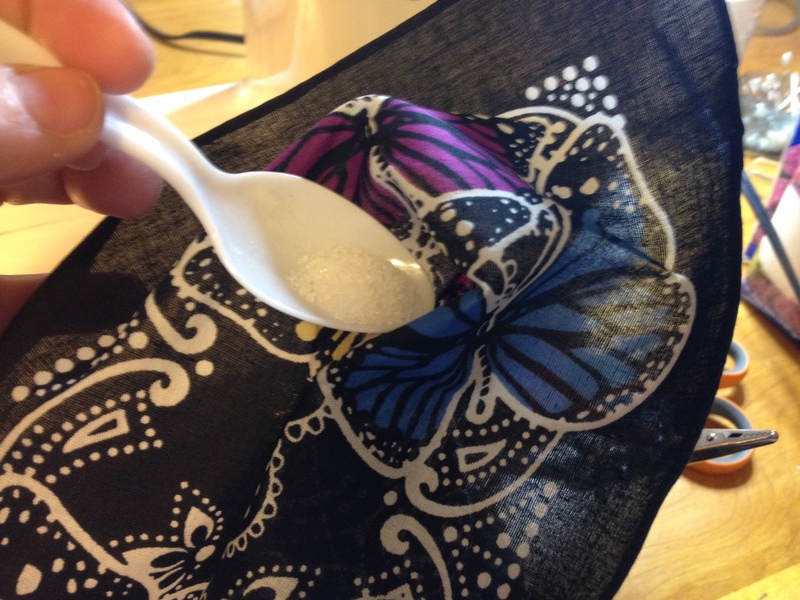 The tissue pattern made it easy to see placement over the prints. You could totally do this without a pattern, in fact next time I will improvise the front flap into a curved or squared shape instead of the point. Just make a newspaper square about 8 1/2″ X 4 1/2″ for the base, a 5″ wide middle piece, and 6 1/2 x 4″ flap. The overall size approx 9″ x 9″. 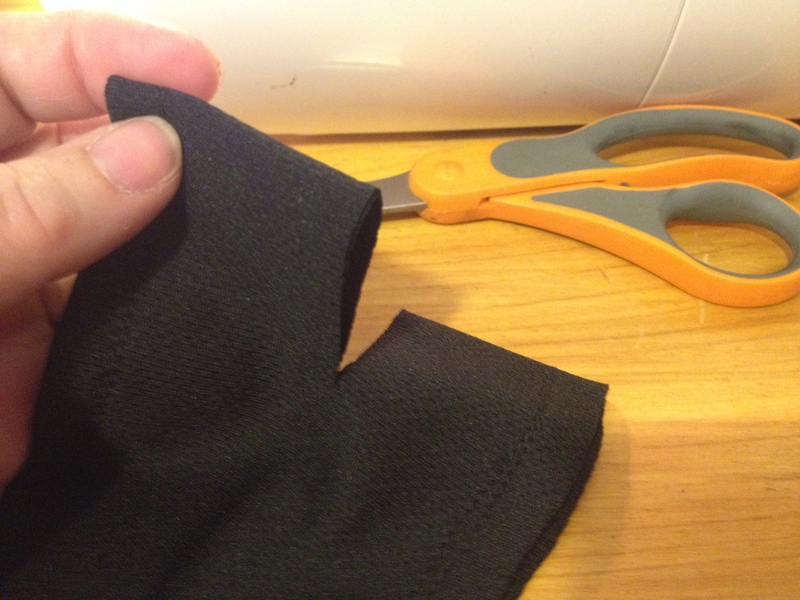 When cutting them out, I did utilize the sleeves (the already hemmed edge) for the bottoms of a couple of the towel tops. If you are using an obvious one way print, be sure to cut one side upside down. 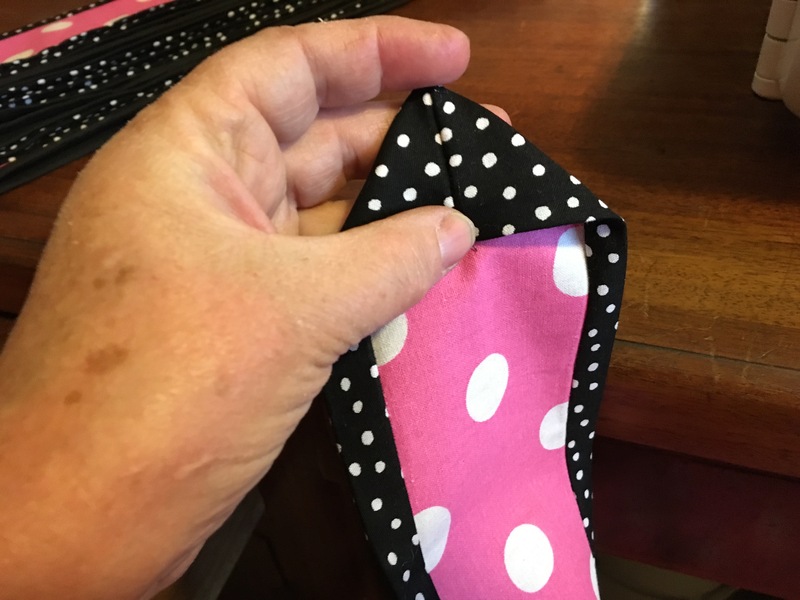 Because after you sew them together, the “flap” needs to be upside down so its right side up when finished. 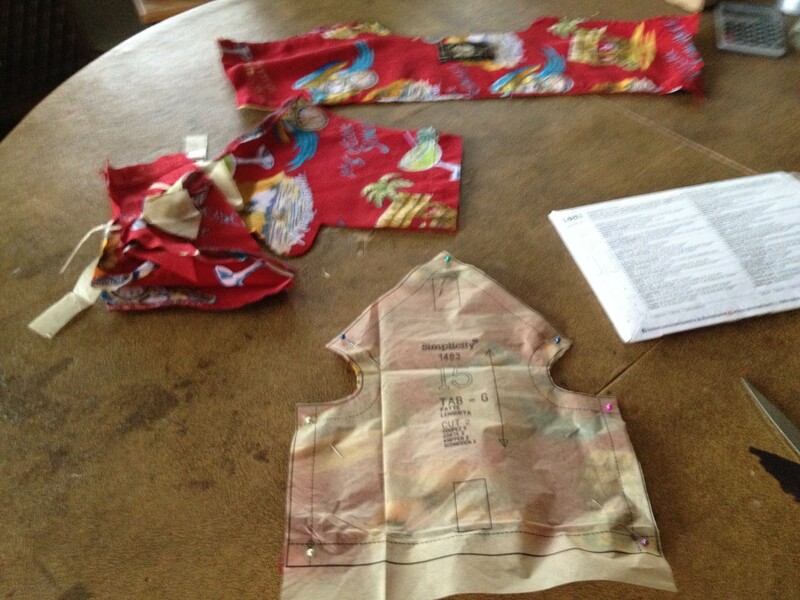 Sew according to directions, right sides together. leaving the bottom open. 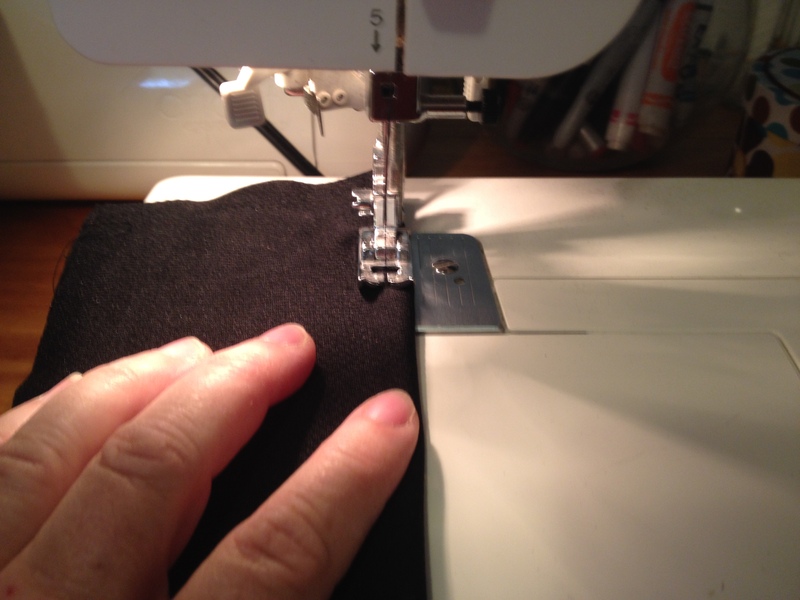 Turn and press a hem along the bottom edge (some were already done) and stitch that down. 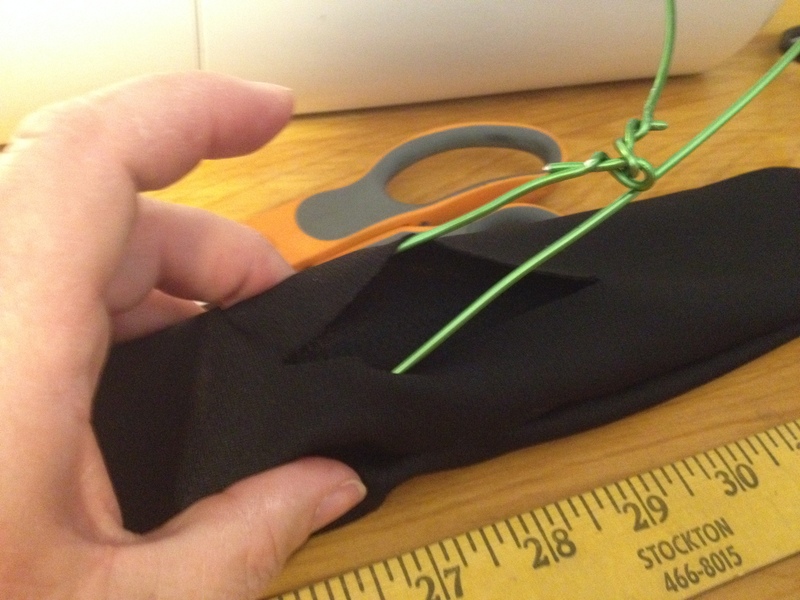 The pattern calls for velcro on the flap to attach, but I opted for a button/buttonhole option. The buttons from the shirt were cool, and since my “Opal” does them automatically, why not? 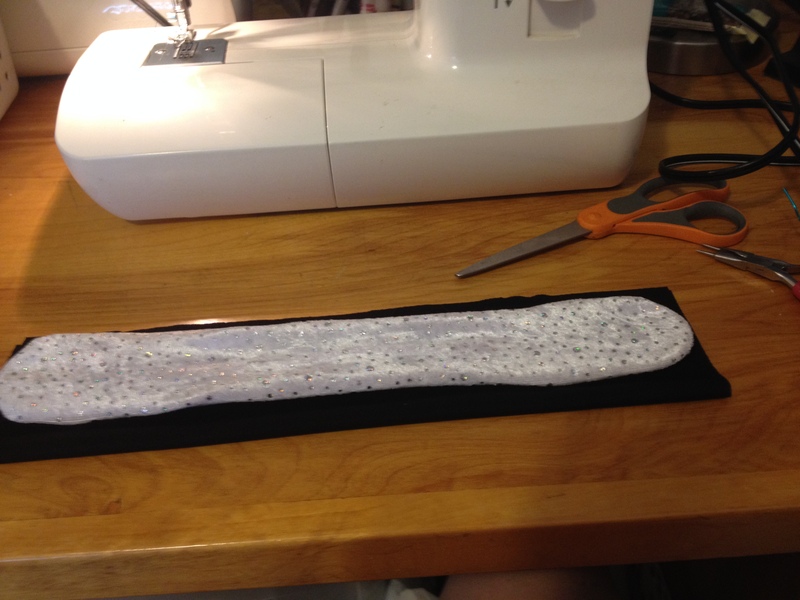 Next step, I removed the hem from one of the short sides of the bar towel. (to reduce bulk) and gathered along that edge. Another of Opal’s super cool attachments, is this automatic ruffler. 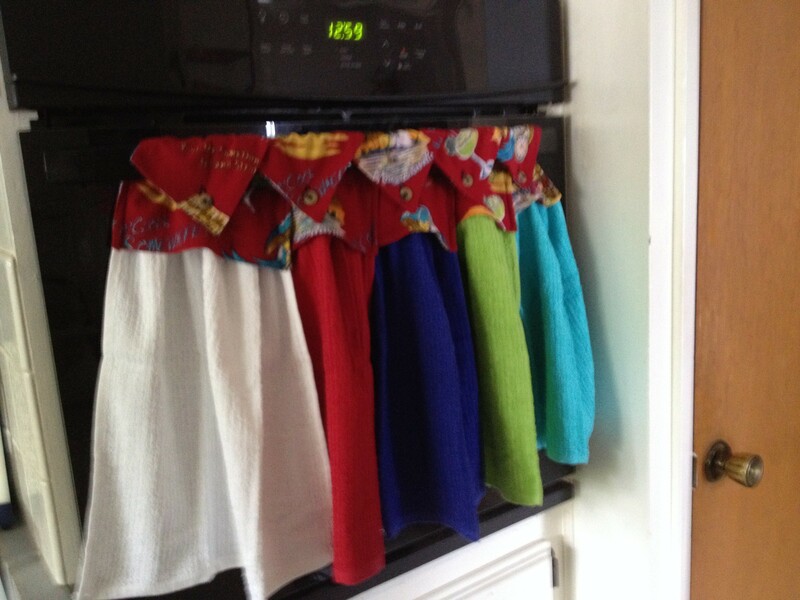 Made gathering the towels super easy and fast. 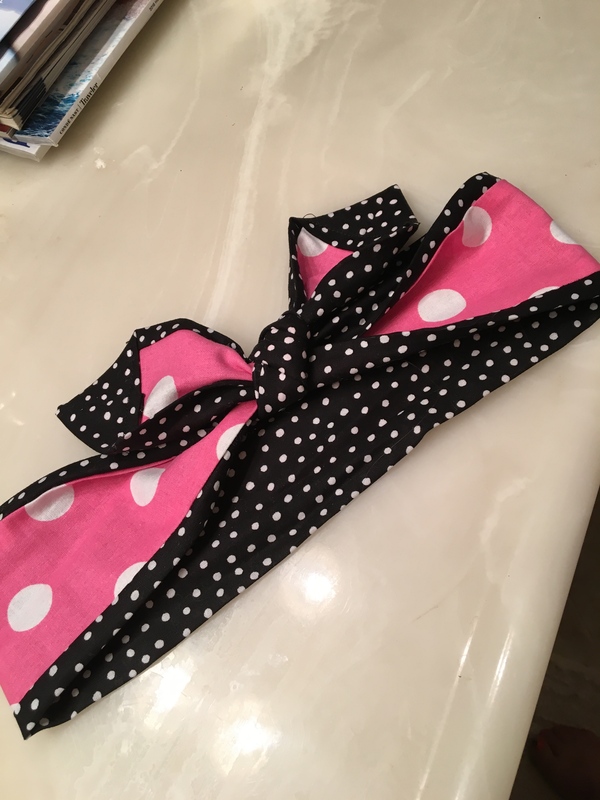 Next, I just put the gathered edge of the towel inside the top, the pattern calls for it to be sewn along the bottom edge, but my towels seemed long (I didn’t trim to 13″) so I put them all the way into the square portion. Pinned the corners and across the top, then topstitched across and down each side to secure the towel inside. 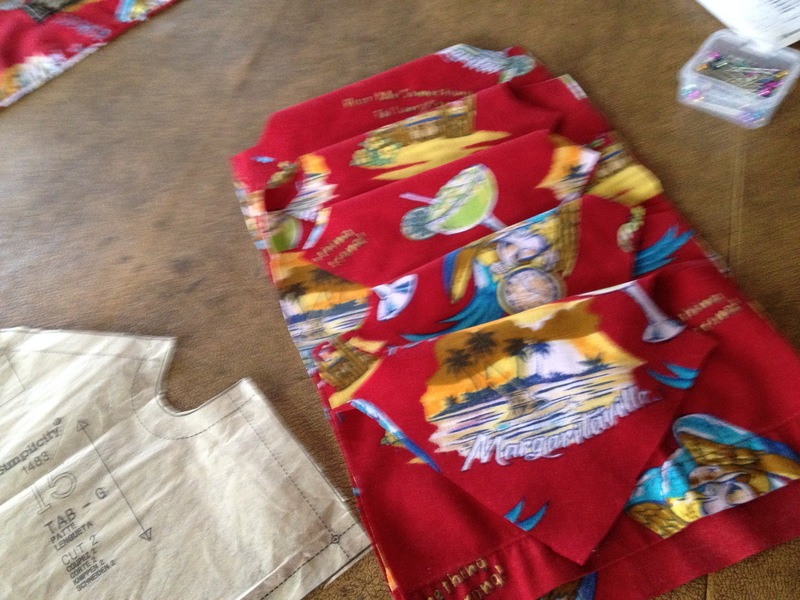 There they are… Margaritaville Bar towels, ready for the Margarita Bar at the Rehearsal Dinner! So when you screw up, pretend like you meant to, and look for inspiration to cover it up! So I did it again, I’m a bad, bad, bad crafter. I bought something at a craft fair to “steal” the secret. Shhhh, I’ll share it with you, only if you keep it a secret! It’s the amazing “wonder bun, EZ bun, Bun easy… what ever it’s called, it’s genus!! Since it is mid-august, and its way too hot for long hair, you need any easy solution for your hair besides cutting it all off! Years ago I had a couple of these thingys, but the holes stretched out, and I forgot how much I loved them. Until this past summer on our road trip, and I found them again in the Marketplace. I was so thrilled, I paid $20 bucks for two of them. Yes, twenty of my hard-earned bucks!! Well you know me by now, as soon as I got home I began “deconstructing” them to figure out what gauge wire, type fabric, size and began customizing them for me. (and you) hint: if you use it on wet hair, you get really nice curls when it’s dry!! Try it at the beach, and you’ll be party ready by night! Think I might do some seasonal ones too! 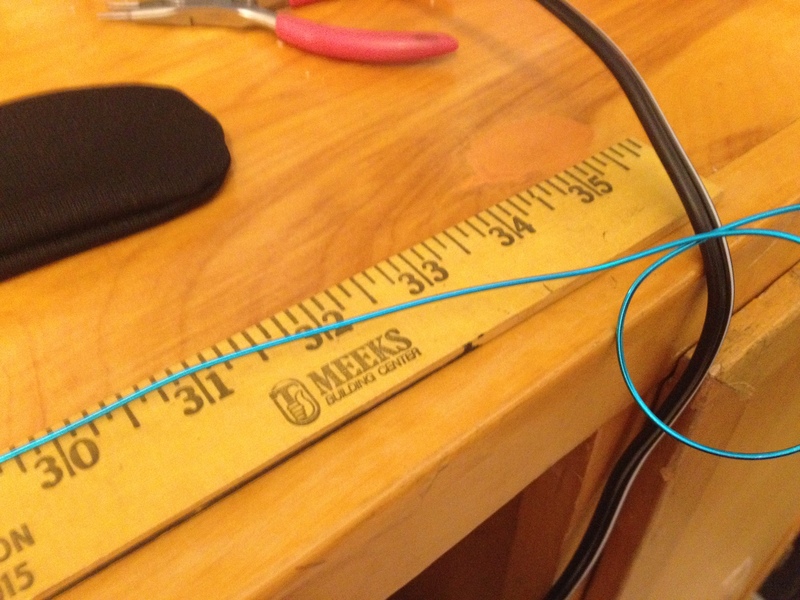 I experimented until I figured out the best measurements. For adults cut fabric 16″ X 4″, children and those of us with really fine hair 10″ X 4″ rectangles. (cut 2). I used the rotary cutter and mat to cut multiples, because I can’t make one of anything! 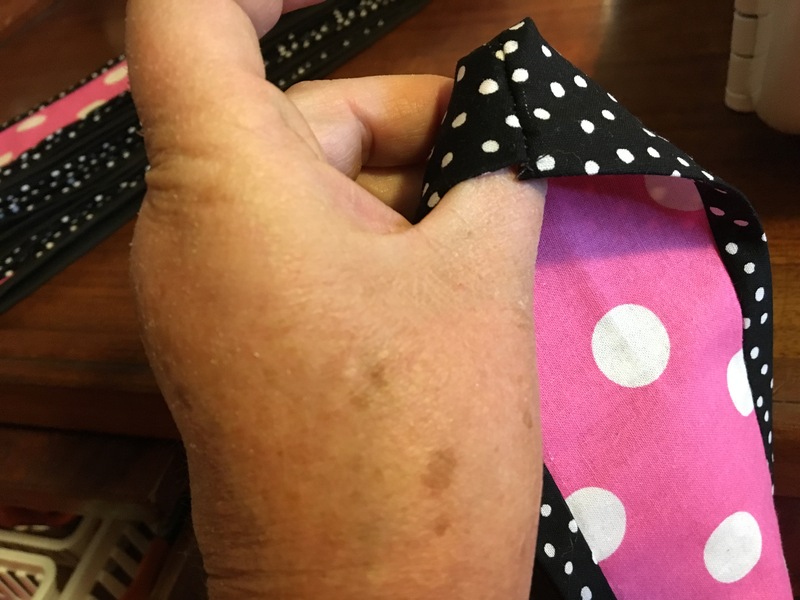 Don’t worry about cutting the ends round, you can do this after you sew them, before you turn them. I worked production line style once I figured out the dimensions. Sssshhh, there’s the original on top, just place the right sides together, and sew down the edges and “round” out the corners. 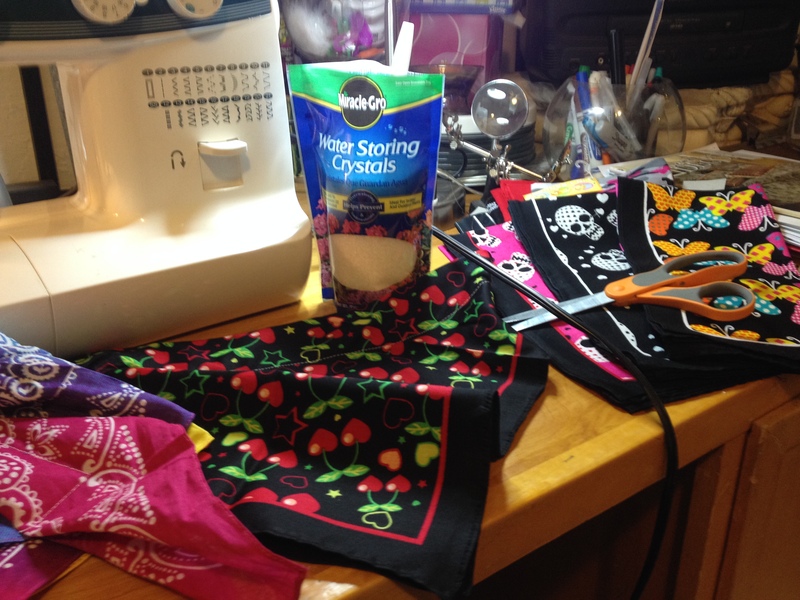 I sewed about a dozen of each color, then trimmed the corners off. 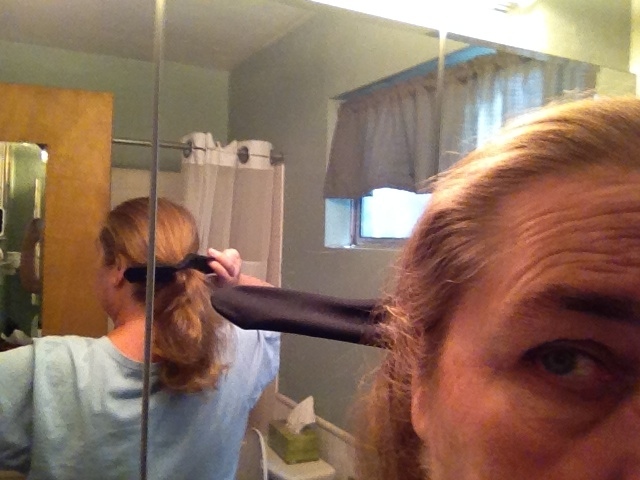 Fold them in half and cut a slit down the middle 4″ hole for adult, 3″ hole kids/fine hair. Use this opening to turn right side out. Cut the wire at 32″ for adults, and 24″ kids/fine hair and twist together to form a large oval shape. 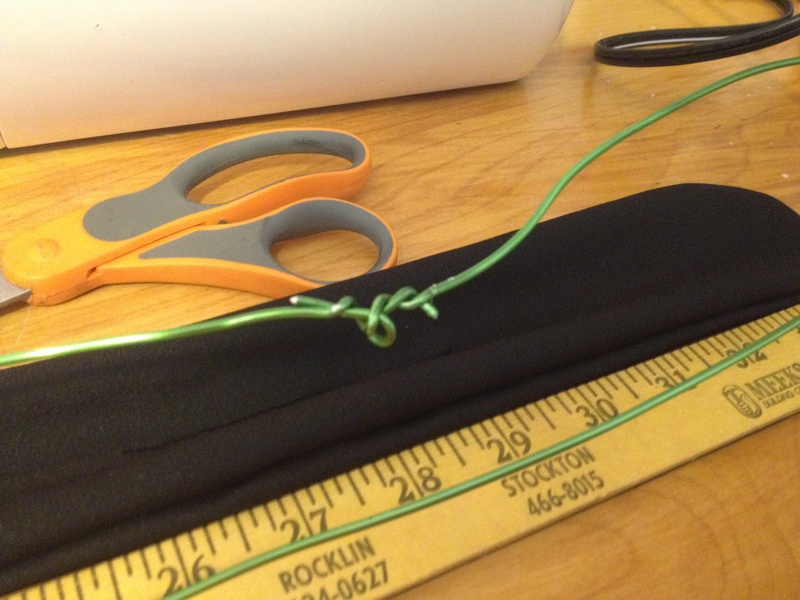 Make sure its tied/twisted securely, you are sewing it inside and don’t want it to come untied. 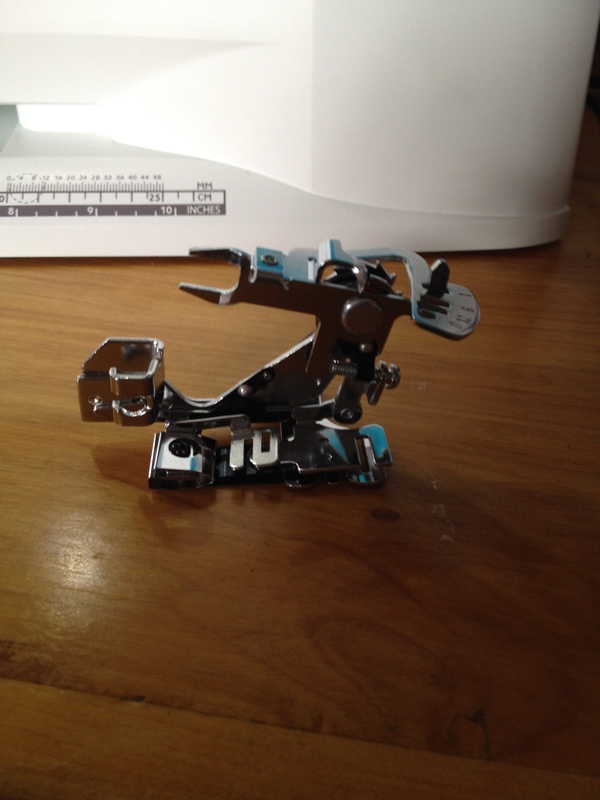 Insert the wire into opening, and stitch it shut. 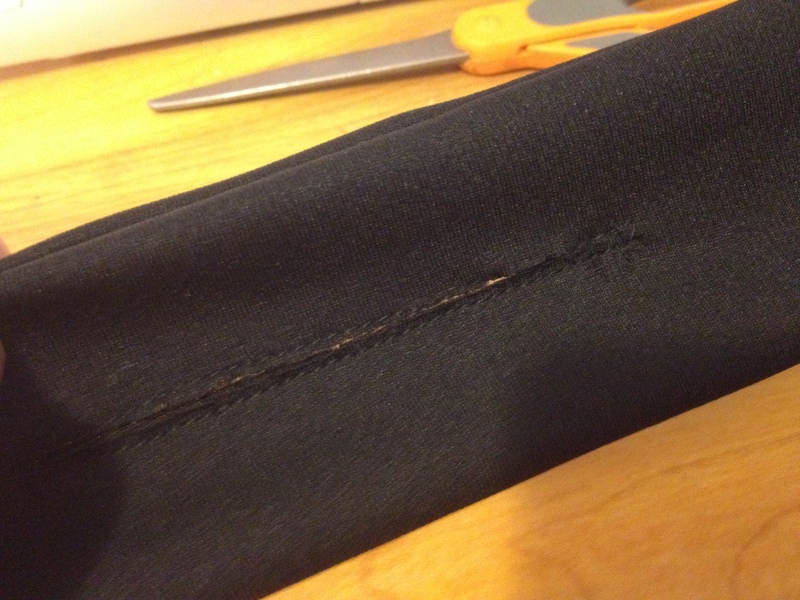 If you have a “fancy” machine you could do a long button hole, but I just topstitched it shut. You won’t see it anyway, your hair goes through it, but neatness counts!! And Voila! easy, wonder, EZ bun maker. So to use it, you just gather up your hair into a pony tail, low if you’re adding a hat, or high if you’re going for naughty librarian. Give it a twist a couple of times to tighten the hole. 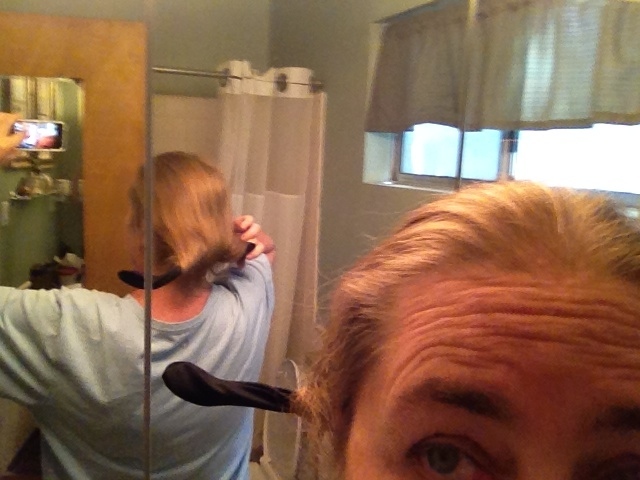 pull down about 2/3 to 3/4 of the hair length, and begin rolling up. Wow. trying to take a selfie is harder than it looks! 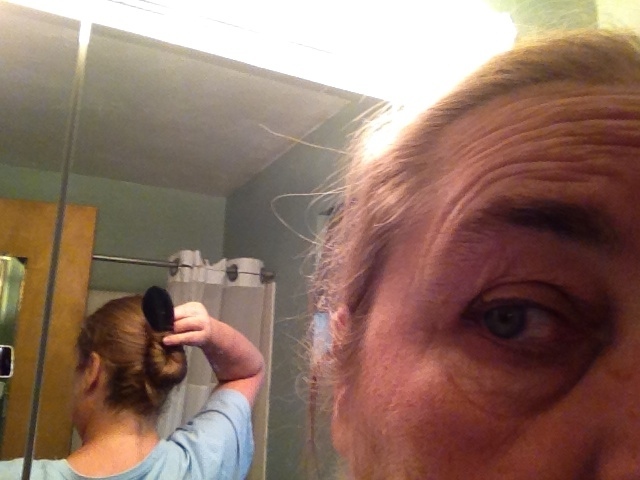 Continue rolling the hair until up against the scalp, but not too tight. Bring the ends together, and twist to secure. 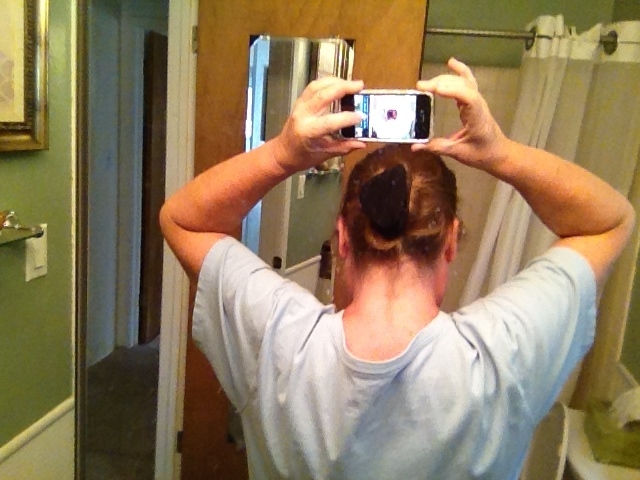 You can tuck them on top, or hide underneath the bun. I think I need one more hand…..
Ta Daaa!! it’s a bun!! 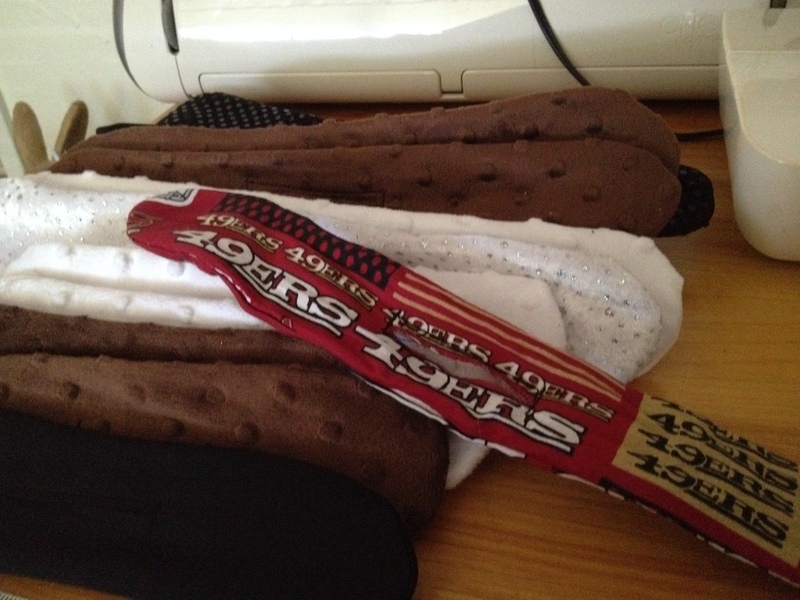 Here’s my 49er one too! You can do a double bun, just use two makers and roll half your hair at a time. 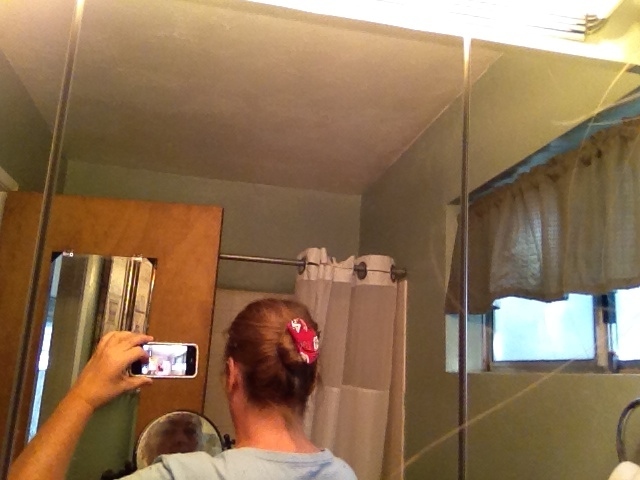 You can do a half bun by only rolling the top and sides of your hair and leaving the lower portion out. Or try a pony bun by rolling the bottom half of your hair, and placing the top portion through the bun before you twist it closed. Since I don’t have a photographer on hand, and two hands aren’t enough to shoot properly, and for more professional styling instructions, please go online to youtube!